This story is part of our winter Book Club conversation about N.K. 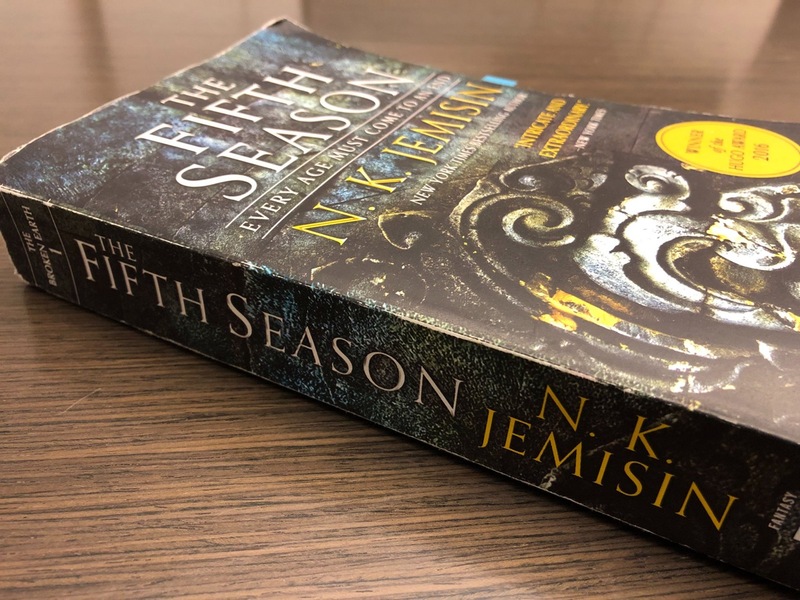 Jemisin’s book ‘The Fifth Season.’ Want to participate? Sign up for our newsletter or send a voice memo to voices@sciencefriday.com. The Science Friday Book Club has had three weeks of lively discussion of N.K. Jemisin’s geology-flavored apocalypse, The Fifth Season. Producers Christie Taylor and Johanna Mayer share some of the best listener comments about the story’s science, sociology, and real-world connections—and invite you to add your voice for one final week of literary nerding out. And we want to hear from you! Record a voice memo on your phone and email it to voices@sciencefriday.com. We may play your answer on the air next week. In the meantime, check out some other readers’ responses below. I recently finished this book the fifth season, while reading about the Civil War and Restoration in Jill Lepore’s new civics book, These Truths, and watching movies like “Sorry to Bother You,” and was struck about how all three seem to spin the same tale: One of slavery, inequity, dehumanization, and hard choices. At times this book felt so real and so current, I had to put it down just to get some space. I think consumers of science fiction are already tuned into science, and are looking for science to be based in reality. It is expected that the author will take scientific liberties to advance the story, but one of the things I love most about the genre is how smart some of these authors are, and how much time they must spend studying about the science to make it believable. I love how Jemisin worked geology into the core of her story. It is so unique. I found myself using her appendices and looking up more information about the science as I read the book. I was struck by how the eminent threat of fear and catastrophe completely shaped the society, both how the people were separated into different class with different rights, as well as how people lived their daily lives and how they communicated with each other. And I think it would be interesting to study how the fear or the presence of possible catastrophes in our world might shape how we live in our society. As a person whose survival instinct is waning during our own times, I find myself wondering what it must be like to have a wish to survive that is so strong that one is prepared to live with brutality, or to brutalize others in the name of survival. When hope is lost, what are people living on? What is it like to live with a brain, a mind, a will like that? JOHN DANKOSKY: Now, you may have noticed that we’re talking a lot about geosciences on the program the last few weeks. And there’s a reason for that. Our sci-fi book club is reading in NK Jemisin’s The Fifth Season. It’s a story about a world in constant geological turmoil. Volcanoes, earthquakes, even shifting magnetic poles, we’ve heard about those. They’re all disasters plaguing the story. And one place our book club is meeting is on Facebook. Here to share some gems from that discussion that’s happening on Facebook, Science Friday digital producer Johanna Mayer. Johanna, welcome. JOHN DANKOSKY: And radio producer, Christie Taylor. Hi there. JOHN DANKOSKY: So when I think book club, I think about people sitting in a room together talking over wine, maybe. How are we doing this on the radio? CHRISTIE TAYLOR: Well, we kind of can’t. I love– I do love the way that we’re able to dive into a piece of literature and really explore it with our guest experts and listeners. But a lot of the time, our on-air conversations can only include so many voices. People don’t get to talk to each other. We have limited time, and so on. JOHANNA MAYER: So that is where the Science Friday Book Club Facebook group comes in. We really wanted to try to put that club back in the book club. And people have really delivered some thoughtful conversations as they’ve been reading. JOHN DANKOSKY: I’m really excited to hear about these conversations, because The Fifth Season has some heavy stuff. I mean, it’s end of the world, personal loss, earthquake magic. What kind of questions have you been chewing on? JOHANNA MAYER: Yes. So for starters, we’ve been talking about this theme of disaster a lot. How the society in the story itself has adapted to disaster, and also how people respond to it on an individual level. I mean, characters in this story are walking away from their entire lives as they know it because of a giant volcano. So this idea of individual resilience was really intriguing to one of our listeners, Denise from Bethlehem, Pennsylvania. DENISE EARECKSON: As a person whose survival instinct is waning during our own times, I find myself wondering what it must be like to have a wish to survive that is so strong that one is prepared to live with brutality, or to brutalize others, in the name of survival. When hope is lost, what are people living on? What is it like to live with a brain, a mind, a will like that? JOHN DANKOSKY: I’m John Dankosky. And this is Science Friday from WNYC Studios. CHRISTIE TAYLOR: And John, we’ve also been talking about how groups of people respond to disasters. JOHANNA MAYER: Yes. So another listener named Jude made a really interesting comparison between the tight knit communities in Jemisin’s world and monasteries in the Middle Ages. JOHANNA MAYER: Yeah. And she said so when Roman civilization was breaking up, these institutions really encouraged an ethical approach to communal life. The monks weren’t just hanging around praying. They also taught those outside the monastery the agricultural knowledge and the skills they needed to survive. And they transcribed written material for future preservation. I thought those communities in Jemisin’s book, in comparison, entirely insular, unwilling to reach out unless they got something in return. So I thought that was a great point about different reactions to disaster and social upheaval. JOHN DANKOSKY: Hm. So social upheaval, I’m guessing people probably had some feelings about how science was portrayed in the story? CHRISTIE TAYLOR: Well, this is a science show, so we did ask about that. And that’s one thing we really, really wanted to explore with people. The Fifth Season is a work of fantasy or maybe science fiction, but it’s rooted in a lot of real geological turmoil. There are these characters who can do earthquake magic, but they’re also stopping aftershocks. They’re trying to plug up volcanoes, but– so the pressure and lava is safely rerouted. They’re talking about fault lines and friction and vibrations carrying through different materials, different kinds of volcanic ash ecological effects, et cetera. So we asked people how they related to that kind of information density. And Erin from Fairfield, Connecticut had this to say. ERIN MORRIS: I think consumers of science fiction are already tuned into science and are looking for science to be based in reality. It is expected that the author will take scientific liberties to advance the story. But one of the things I love most about the genre is how smart some of these authors are, and how much time they must spend studying about the science to make it believable. I love how Jemisin worked geology into the core of her story. It is so unique. I found myself using her appendices and looking up more information about the science as I read the book. JOHANNA MAYER: That said, this is a book about disasters and about violence. And NK Jemisin is a black woman writing about this oppressed group of people. And the Orogenes– these people in the book could do earthquake magic– are treated in ways that pretty directly parallel slavery and racism in America. And some of our readers have been reacting to this as well. So [? Yvonna ?] from Santa Cruz, California said she found those parallels overwhelming. YAVONNA REYNOLDS: I recently finished this book, The Fifth Season while reading chapters on the Civil War and Restoration in Jill Lepore’s new civics book, These Truths, and watching movies like Sorry to Bother You. And was struck about how all three seemed to spin the same tale, one of slavery, inequity, dehumanization, and hard choices. At times this book felt so real and so current, I had to put it down just to get some space. JOHN DANKOSKY: Hm. It sounds like people are digging into this a lot, yeah. CHRISTIE TAYLOR: Yeah, they really are, John. And we want to keep digging. Next Friday on the show, we’re going to sort of complete this book club with a conversation with seismologist Lucy Jones and sociologist Lori Peek. On the air so far, we’ve been talking about volcanoes, earthquake, geosciences, the center of the Earth. But we really plan to explore disaster sociology with this conversation. Lori Peek has researched a lot of the social dynamics around Hurricane Katrina and who was hurt most in that situation, for example. And they’re both people have a lot to say about what makes a natural hazard into a human scale disaster. Those are two very different things. JOHN DANKOSKY: So next week on the show, Ira’s going to be back for that conversation. But let’s just say I wanted to get involved. What would I do, Johanna? JOHANNA MAYER: Yes, we have one more discussion question that we want people to think about as they finish up their reading. So here it is. This is a book where there are many different voices and many different storytellers, from the shifting narratives to the way that societal knowledge and history is transmitted through this concept of stone [? lore. ?] So how do all of these voices shape our understanding of the story? CHRISTIE TAYLOR: And you can think about that a little bit, John, and then join the Science Friday Book Club on Facebook. But we also really, really want you to send us your comments as voice memos, so we can include them in next week’s show, kind of like we did today with other people. So to do that, check out our website, ScienceFriday.com/FifthSeason. That’s ScienceFriday.com/FifthSeason to send us a voice memo. Join the conversation and share your thoughts. JOHN DANKOSKY: So it’s still not too late to get involved? CHRISTIE TAYLOR: It is not too late at all. JOHN DANKOSKY: Excellent. Radio producer Christie Taylor and digital producer Johanna Mayer. Thank you both so much for bringing us this. It’s very exciting. CHRISTIE TAYLOR: It’s our pleasure.